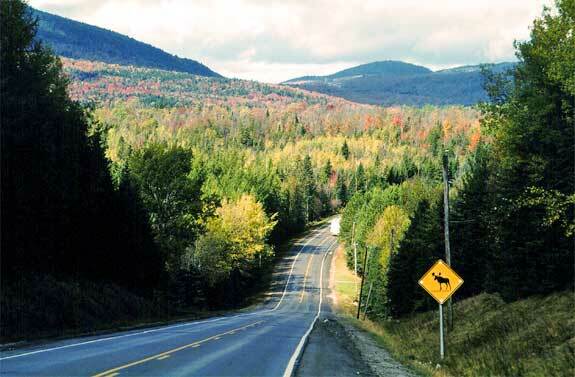 Old Canada Road heads north, curving into thick forests and rolling mountains that lie at the horizon. © September 1999 Maine Department of Transportation. One of the most pleasurable ways to experience Maine is through its’ excellent highway system. Driving a car gives you the flexibility to stop at quaint seaside villages, explore the mountains, or meander through stately forests. Roll down your windows to experience the fresh air and Maine’s natural beauty. With a turnpike system, several scenic byways, and extensive highways, Maine offers many driving options for tourists and residents alike. The Maine Turnpike is a 106-mile stretch of highway that extends from York through Portland before terminating in Augusta. The turnpike stays close to the coast, providing easy access to popular seaside towns and vacation destinations. The toll depends on the length of time you stay on the turnpike; driving from York to Augusta costs $5 for a two-axle vehicle. Frequent toll users can purchase an EZ-Pass to get discounted fares and pay electronically. Interstate 95 is the major highway that passes through Maine, running the length of the state to Canada. The Maine Turnpike is part of I-95, while the rest of the highway is toll-free. I-295 is a freeway that leads directly from Portland to Augusta. Other major highways in Maine include Highway 117, which runs northwest from Portland to New Hampshire; Highway 201, leading from Winslow to the Quebec border; and Highway 1, which hugs the eastern part of the state line beginning in central Maine. Maine boasts several scenic byways that allow you to experience its natural beauty. The Acadia All-American Road gives access to Acadia National Park, one of the most popular in the U.S. Whether you enjoy spruce forests or serene sailboats, this byway provides stunning views. The Old Canada Road Scenic Byway, a segment of Highway 201, winds along several beautiful lakes and rivers, providing views of old-growth forests and wildlife. The Rangeley Lakes Scenic Byway passes through western Maine and its historical villages, stunning mountains, and rich wildlife. If you want to travel off the beaten path, drive the Schoodic Scenic Byway, which passes through the less traveled part of Acadia National Park and other parts of the eastern seaboard. This byway provides expansive ocean views and an opportunity to watch locals involved in lobstering and clamming.